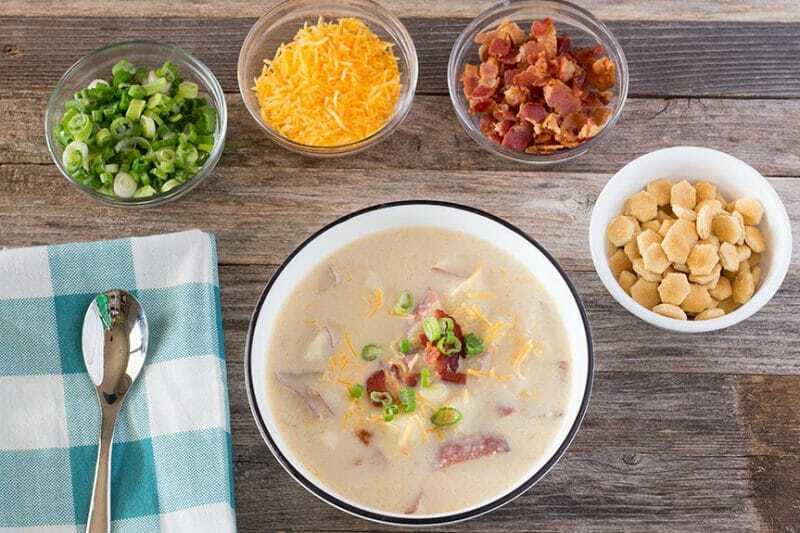 A Loaded Baked Potato Soup recipe with a secret restaurant ingredient for a more flavorful broth, topped with all the goodness of a loaded baked potato. 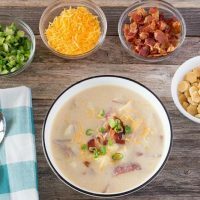 Loaded Baked Potato Soup is another restaurant inspired soup that I keep in my wintertime menu rotation. The recipe for this one was given to me by one of the restaurant’s owners. The restaurant is long gone now. After making it so many times, I just throw things together in a pan and serve it up. He swore that his secret ingredient was ham soup base. This can usually be found in the Latin section of many local grocery stores. I prefer to use Goya brand since it comes in perfect sized little packets. Better Than Bouillon is my second choice and I generally find that brand located in the soup aisle. Chicken broth also brings some flavor to the soup. Potatoes will dilute your flavors. Some people even swear by adding potatoes to broths that are too salty. I have never had any luck with this theory. Looks like these folks agree with me, it just doesn’t work. I suppose this is called baked potato soup just because of the toppings added at the end. There are no baked potatoes in it. I bet you could use leftover baked potatoes in it though. I would reduce the cooking time though. You don’t want mashed potato soup instead of baked potato soup. I have used baking and red potatoes in it before, it seems to me that using baking potatoes produces a thicker soup and requires a bit more of your dairy product. I prefer to use fat-free half & half, not because it has fewer calories but because it seems to hold together better for me with no separation. With that being said, I have used regular half-and-half, all of the cow milk version from skim to 4%, and even used heavy whipping cream. Treat the dairy product gently during heating and they all work. I have not used evaporated milk or reconstituted powdered milk, but based on my experience with this soup I am certain they would also work. Substituting the milk or half and half with soy milk, unsweetened coconut milk, and unsweetened almond milk should also be fine in this soup. Again, just treat them as gently as you would cow’s milk. I serve mine with bacon, green onions, and cheddar cheese. I don’t serve sour cream with mine as a matter of personal preference, but feel free to add some to yours if you like it. 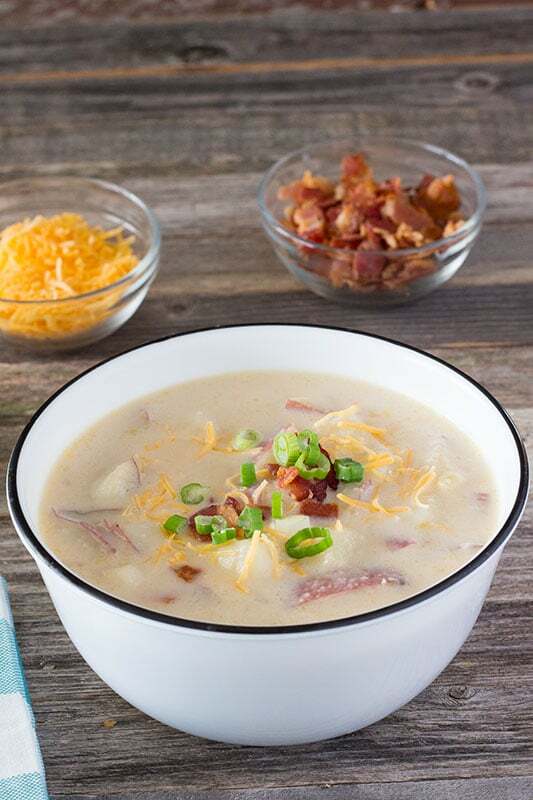 You can make Loaded Baked Potato Soup without onions and without celery if you don’t like either of those ingredients, but I think they add a bit of flavor. Add broccoli, carrots, or any other vegetable you like. The ham based broth will compliment many vegetables. This recipe can be made in a slow cooker too! Add everything except the milk and cook on high or low until the potatoes are tender. Reduce the heat to low, add the dairy and let it continue cooking until it is heated through. 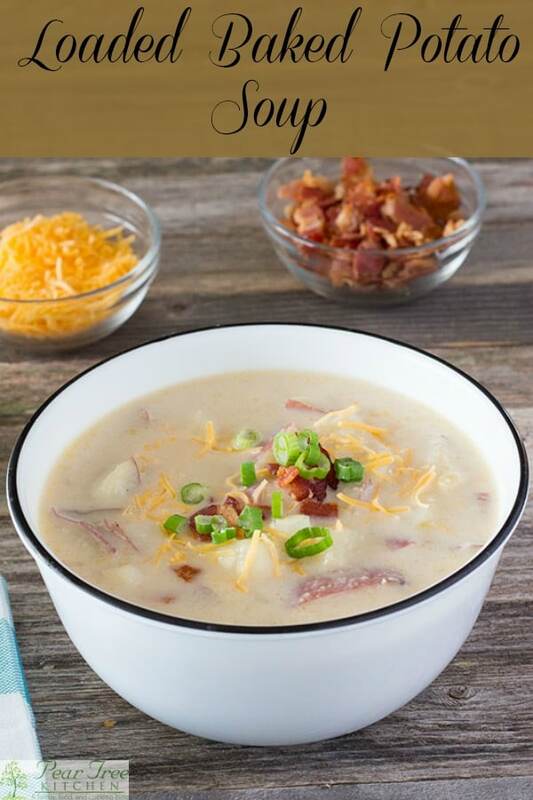 Easy to make Creamy Baked Potato Soup with ham base as the secret ingredient that elevates this soup's flavor to a different dimension. Heat butter in large soup pot or Dutch oven over medium heat, until melted. Add onions and celery and cook just until tender. Add chicken broth and ham base. Simmer for at least 30 minutes and up to 4 hours. If you choose a longer simmer time, add water as needed to keep the pan from getting dry. Add potatoes and enough water to cover potatoes. Increase heat to high and heat until liquid boils. Reduce heat to medium-low and simmer until potatoes are tender. 30 to 90 minutes. Add half and half or other dairy milk product. Taste the broth, if it is too salty, add water or more half-and-half. Continue heating over low heat until hot. Serve with bacon crumbles, thinly sliced green onions, and cheddar cheese if desired.